UTT Throwback Thursday: Will DOJ Prosecute CAIR/Hamas for FARA Violations? 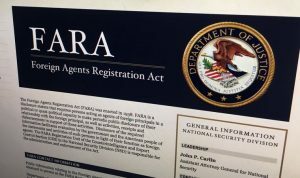 The Foreign Agents Registration Act (FARA) of 1938 requires all entities which act as “agents of foreign principals” to register with the U.S. government and are subject to oversight and restrictions. FARA is critical to combat counterintelligence threats, and was created to thwart propagandists inside the United States. On Wednesday, July 26, 2017, a hearing was held by the Senate Committee on the Judiciary entitled: “Oversight of the Foreign Agents Registration Act and Attempts to Influence U.S. Elections: Lessons Learned from Current and Prior Administrations.” In that hearing, senior Justice Department officials testified that organizations which act on behalf of foreign powers and fail to register as required by FARA should be prosecuted. See the full hearing HERE. Muslims conducting propaganda on behalf of the Islamic Movement in general, nation states and jihadi organizations specifically, which continue to use propaganda to advance our enemy’s objectives, should all be registered under FARA. None have. 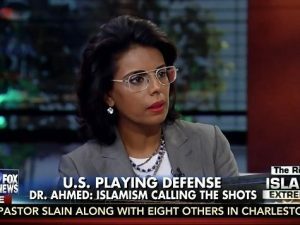 UTT has documented propagandists working inside the United States on behalf of the Muslim Brotherhood and the Islamic Movement, to include Dr. Qanta Ahmed. See UTT’s videos HERE and HERE. 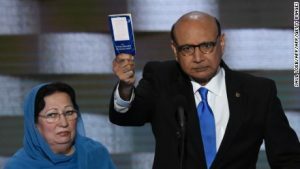 The information/propaganda operation executed by Khizr Khan at the Democrat National Convention reveals an investigation should be initiated because he is acting on behalf of foreign powers (Pakistan and possibly Saudi Arabia) against the United States. Hamas doing business as the Council on American Islamic Relations (CAIR) is an clear example of an organization – in this case a TERRORIST organization (Hamas) – acting on behalf of foreign powers which has not been registered. The diligent work by the Center for Security Policy’s CAIR Observatory details some of the evidence that CAIR is in violation of FARA. 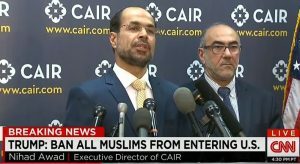 If not for anything else, CAIR can and should be be prosecuted for violations of FARA today. Islam and it’s organizations are the biggest threat to our country today !!!! I pray that our government will clean out this infestation that corrodes our constitution and the laws of our land. I look at what is happening in Europe and it sickens me and I don’t want that to be what happens to the USA. They already have a strong foothold in some parts of our country and it must be stopped before that gets any stronger. Their ideology is against humankind and Sharia Law is so frightening and sick. Hamas, CAIR and The Muslim Brotherhood should be outlawed ASAP. Though mainly created for the purpose of focusing on criminal propagandists, prior to 1942 administration of the “FARA” ACT of 1938 was inexplicably the responsibility of the State Department. Following rational devolvement of that arrangement to the Department of Justice, however, “FARA” was successfully used during the 2nd World War to prosecute 23 cases. More pertinent to a latter-day point, however: in 1966, three years after Muslim Brotherhood jihadists arrived in Illinois USA to establish their first – (of now 700) – “Muslim Student Association” jihadist recruiting outposts on behalf of advancing the global Islamist Movement’s stated goal* to “eliminate and destroy Western civilization from within”, FARA was amended so as to increase the government’s burden of proof for any conviction. Thus, the only three cases since brought for FARA violations in the aftermath of said dubious change resulted in two dismissals and one loss due to a problem involving the statute of limitations. Now though the plot thickens. I.e., J. Edgar Hoover was a Washington DC native son who grew-up on Seward Square SE near the Capitol, never lived away from said city, and with respect to protecting the country during his forty-eight years as Director of the FBI from subversives, communists, anarchists, saboteurs, treasonous quislings, garden variety hoodlums and “Public Enemies No.1” (1924-1972) was an eagle-eyed American Patriot. Thus, what did he know; when did he know it and where are his findings. I.e., given his instincts and reputation for law-enforcement precision, where was Mr. Hoover, of all people, in 1948 & ’49 while Sayyid Qutb, arguably the West’s most virulent critic, reputed brains of the Muslim Brotherhood, and one of the world’s foremost advocates for a revival of pan-Islamization (whose disciples included Hamas, Islamist and al-Qaeda jihadists) was spending the Christmas season in New York City; studying English at Wilson’s Teachers College in Washington DC; then, before returning to Egypt from whence he was allegedly sent to the United States for personal-security reasons, spending six-months taking graduate courses at the Colorado State College of Education in Greeley, before leaving to tour California? The relevant void simply doesn’t add up. (partial paraphrase of Denver Post edition of 5 February 2011). Furthermore, regarding the lead UTT question, In view of the fact that the penultimate director of the FBI, both pre & post 9/11, engaged respectively in criminal negligence then (effectively) treason, by denying several urgent requests of FBI Special Agents for warrant and USA conference authorizations threaded to common suspicions of imminent sharia-adherent Islamist terrorist attacks on the United States, denials which contextually disabled the ability of the FBI to enforce federal law and/or (subsequently) prevent- AS OPPOSED TO ASSIST & FACILITATE – the departure of the only relevant material witnesses (13) known to be on American soil respecting the 2996 murders of (mainly) American citizens which had ensued – I tend to believe that the Department of Justice, rather than prosecute CAIR/HAMAS for FARA violations, would be more inclined to invite the accused to lunch, and after apologizing for any inconvenience, bestow some sort of bizarre award on the criminals. * See, for a nominal handling fee, the actual federal court document which the FBI seized from a subterranean basement in Annandale, Virginia, in 2004 and subsequently introduced as evidence in the largest Islamic terrorist money laundering trial in American history. It was approved by the Muslim Brotherhood in 1987 as the general strategic goal of the group in America, and equates unequivocally, in clear text & their own words, to a declaration of war: [contact http://www.securefreedom.org and request GOVERNMENT EXHIBIT 003-0085 3:04-CR-240-G U.S. v. HLF, et al]. Congress needs to pass a law declaring that Islam is not a religion but a geo-political totalitarian system (like Nazism or Communism) opposed to the US Constitutional form of government and thus stripping Islam of its First Amendment protections.